There is one big challenge right at the beginning of any ISO 20000 project: It is not quite clear what exactly you need to do in order to become compliant with ISO 20000. This is where the YaSM® - ISO 20000 Bridge comes into the picture. For every ISO 20000 requirement you will find a specific suggestion on how it can be fulfilled, in the form of easy to understand process and document templates. Watch a video with Stefan Kempter introducing the YaSM - ISO 20000 Bridge (6:04 min). At the beginning of your ISO 20000 initiative, the Bridge enables you understand what exactly it means for your organization to become ISO 20000 compliant (what should you aim for and how much change is needed?). The process templates make the huge task of designing ISO 20000 compliant processes for your organization manageable. Rather than starting with a blank page, you are able to modify existing process models. The checklists support the creation of ISO 20000 compliant documents, policies and records. Again, you are able to modify document templates rather than starting with a blank page. The well-structured and professionally designed YaSM reference process model guides you on your way to creating high-quality process documentation which is able to stand up to your auditor's scrutiny. Your certifier will check if staff have a good understanding of the processes in your organization. The legible, easy to understand process documentation is a big advantage in this respect. The comprehensive list of ISO 20000 requirements can be used as a project dashboard, allowing you to keep track of your organization's progress toward ISO 20000 compliance. The YaSM - ISO 20000 Bridge is designed to be used in combination with the YaSM Process Map. A set of detailed diagrams relates the standard's 149 single requirements (ISO/IEC 20000:2018 Part 1: Service Management System Requirements - these are the mandatory requirements) to the 125 process diagrams and 95 checklists of the YaSM Process Map. You are thus able to start from the ISO 20000 requirements, and to open the corresponding process and document templates with a mouse-click. In addition, the YaSM - ISO 20000 Bridge contains the complete set of ISO 20000 requirements as a sortable and filterable Excel worksheet. 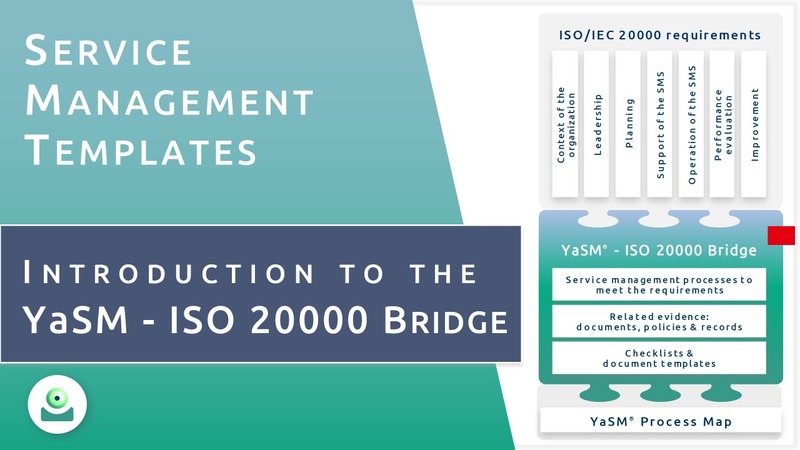 The YaSM - ISO 20000 Bridge is currently available in English or German for Microsoft Visio® and the ARIS Process Platform™. Details about the latest version of ISO/IEC 20000:2018, published on 15 September 2018.